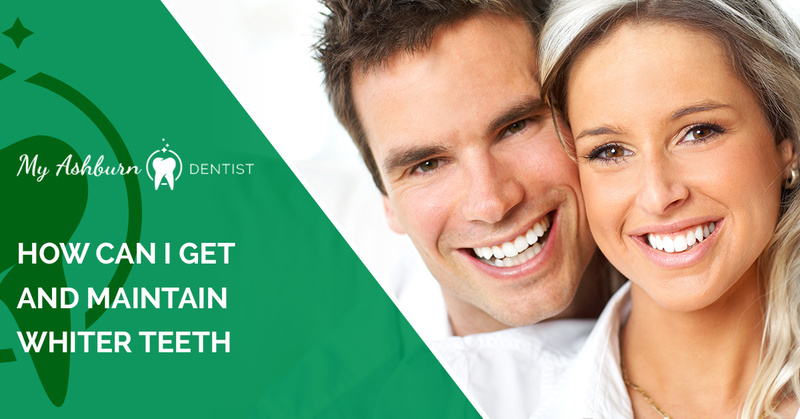 The dental professionals at My Ashburn Dentist in Ashburn, Virginia can help you sort through the claims and choose the most effective and safest methods for getting and maintaining whiter teeth. There’s little reason for whitening your teeth if the process may do long-term damage. Many concerns about whitening products revolve around potential damage to your enamel – that tough outer layer that protects the more sensitive, inner structures of your teeth. Other worries include what effect whitening might have on your gums. While your teeth are often considered the stars of your smile, healthy gums are essential to maintaining oral health and preventing tooth decay. The safety and success of a specific product often depends on the condition of your gums and enamel before you apply the substance – and the only way to determine that is with a professional dental exam. That’s why we recommend you consult your dentist before you try any product or natural remedy for brightening your smile. We also discuss how much whitening you can realistically expect from an in-office product versus an OTC technique or natural remedy. By far the most effective, fastest, and safest whitening procedure available is an in-office bleaching process. At My Ashburn Dentist, we apply a concentrated hydrogen peroxide gel to the outer surfaces of your teeth to effectively change their color and provide you with a brighter, whiter smile. We also use laser light technology to accelerate the process. You’ll see results immediately after the procedure, which takes 1-2 hours overall. The risks are minor, and side effects are minimal. A few patients note increased tooth sensitivity for a brief period following the treatment which usually fades quickly. The whitening effects can last for many months to years. OTC whitening gels for home use also contain hydrogen peroxide as a bleaching agent, but the concentration is much weaker than the formula your dentist uses. These products will likely whiten your smile, but it can take a while. Many come with trays that you fill with the bleaching substance, slip over your teeth, and leave in place for as long as directed. You can expect to repeat this process once or twice daily for two weeks. Possible side effects include gum irritation and increased tooth sensitivity. Whitening toothpastes available over the counter contain mild abrasives, such as baking soda, or chemicals that gently polish away or dissolve surface stains on your teeth. They can’t change the natural color of your teeth, but you may notice your teeth appear whiter after 2-6 weeks of regular use. Harsh abrasives can cause considerable damage to your tooth enamel and leave you prone to developing cavities. During your office visit, we’re happy to discuss which brands are safe and provide the most benefit. A trending favorite for at-home teeth whitening is activated charcoal. It’s an admittedly messy process that often works. Charcoal is a natural adhesive that binds with tooth-staining substances such as coffee, tea, wine, and plaque and removes them when you spit. It only works on surface stains, however, and cannot turn your naturally darker or yellow teeth bright white like bleaching does. It’s important to note that the abrasiveness of activated charcoal may quickly wear away your protective enamel if you use it to brush your teeth. It’s meant to be patted on the surface of your teeth and then rinsed away with water. We can give you tips on how to use this increasingly popular whitening technique. Along with routine dental exams and professional cleanings, the most effective way to maintain your smile’s bright, good health is following the daily brushing and flossing techniques we recommend. Beyond that, prevention is often the best cure. Avoiding coffee, tea, and other products known to stain your teeth helps keep them white. When you can’t resist that morning coffee or evening glass of wine, rinsing your mouth with clear water afterward helps reduce the risk. Fresh vegetables such as carrots and celery have a slightly rough texture that can naturally clean your teeth after a meal. This texture helps remove stain-causing residue that can dull your smile. They also contain tooth-friendly nutrients that help keep your mouth healthy. While slightly acidic, fresh apple slices are also natural cleansers and much preferred as a healthy dessert that can satisfy your sweet tooth without causing the damage that caramel and other sticky treats can.